Trinity County is a county in the northwestern part of the state of California. As of the 2010 census, the population was 13,786, making it the fourth least-populous county in California. The county seat and largest community is Weaverville. Weaverville has the distinction of housing some of California's oldest buildings. The courthouse, built in 1856, is the second oldest in the state, and the Weaverville Drug Store has been filling prescriptions since 1852. The Joss House is a historic Taoist temple built in 1873. Trinity County is rugged, mountainous, heavily forested, and lies along the Trinity River within the Salmon and Klamath Mountains. It is also one of three counties in California with no incorporated cities. The county takes its name from the Trinity River, named in 1845 by Major Pierson B. Reading, who was under the mistaken impression that the river emptied into Trinidad Bay. Trinity is the English translation of Trinidad. 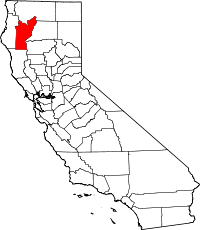 Trinity County was one of the original counties of California, created in 1850 at the time of statehood. Parts of the county were given to Klamath County in 1852 and to Humboldt County in 1853. According to the U.S. Census Bureau, the county has a total area of 3,208 square miles (8,310 km2), of which 3,179 square miles (8,230 km2) is land and 28 square miles (73 km2) (0.9%) is water. The county contains a significant portion of Shasta-Trinity National Forest, home to the Trinity Alps. The county hosts many visitors, especially during summer months, for camping, backpacking, boating on the lakes, rafting/kayaking on the rivers, hunting, and fishing. The summers tend to be clear, sunny, warm, and very dry, with little rain from June to September except for some mountain thunderstorms in the highest elevations. The winters tend to have copious precipitation, falling mostly as rain under 1000m/3300 ft in the valley bottoms, and mostly as snow over 1000m/3300 ft on the mountainsides. December, January, and February are the wettest. There is an extensive wild river and stream system, and the terrain is quite rugged and forested, with the highest point at Mount Eddy, over 9,000 ft (2,700 m). The Klamath Mountains occupy the vast portion of the county. Trinity was a Republican-leaning county in Presidential and congressional elections until recently; now it is a tossup. No Democrat had won the county since Jimmy Carter in 1976 until Barack Obama defeated John McCain by a 4% margin (50% to 46%) in 2008. In 2012, the county again voted Republican, but narrowly. Voter registration reflects this trend, with Democratic and Republican registration in a near dead heat (D: 2,710, R: 2,716). Third-party candidates tend to do rather well in Trinity County: George Wallace got over 13% of the county's vote in 1968, and it was the only California county carried by Ross Perot in 1992. It was also Perot's best performance in the state in 1996, although he didn't carry it again. John Anderson also did very well in 1980, as did third-party candidates in 2016. Trinity County is in California's 2nd congressional district, represented by Democrat Jared Huffman. In the state legislature Trinity is in the 2nd Senate District, represented by Democrat Mike McGuire, and the 2nd Assembly District, represented by Democrat Jim Wood. In 2010, Trinity County voted against Proposition 19, which would have taxed and regulated marijuana. In 2016 Trinity County residents were asked again to vote on legalization of state-level recreational marijuana, facilitated by the Adult Use of Marijuana Act (AUMA), also known as California Proposition 64. The measure passed with 50.1% in favor of legalization. Statewide, the measure passed with 57.1% of the vote. 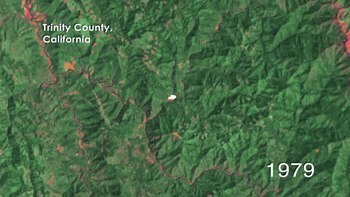 Timelapse of section of Trinity County, California, looking at evidence of clear-cut logging over the years 1972-1994. Data from Landsat satellites. Trinity Transit provides weekday intercity bus service on State Routes 3 and 299, with connecting service in Willow Creek and Redding. Service is also provided from Weaverville to Lewiston (MWF) and Hayfork (daily). The county owns five general aviation airports: Trinity Center Airport, Weaverville Airport, Hayfork Airport, Hyampom Airport and Ruth Airport. The 2010 United States Census reported that Trinity County had a population of 13,786. The racial makeup of Trinity County was 12,033 (87.3%) White, 59 (0.4%) African American, 655 (4.8%) Native American, 94 (0.7%) Asian, 16 (0.1%) Pacific Islander, 217 (1.6%) from other races, and 712 (5.2%) from two or more races. Hispanic or Latino of any race were 959 persons (7.0%). As of the census of 2000, there were 13,022 people, 5,587 households, and 3,625 families residing in the county. The population density was 4 people per square mile (2/km²). There were 7,980 housing units at an average density of 2 per square mile (1/km²). The racial makeup of the county was 88.9% White, 0.5% Black or African American, 4.9% Native American, 0.5% Asian, 0.1% Pacific Islander, 0.9% from other races, and 4.4% from two or more races. 4.0% of the population were Hispanic or Latino of any race. 16.1% were of German, 13.4% English, 12.1% Irish and 9.5% American ancestry according to Census 2000. 97.3% spoke English and 1.8% Spanish as their first language. There were 5,587 households out of which 25.4% had children under the age of 18 living with them, 50.5% were married couples living together, 10.1% had a female householder with no husband present, and 35.1% were non-families. 29.5% of all households were made up of individuals and 11.1% had someone living alone who was 65 years of age or older. The average household size was 2.29 and the average family size was 2.80. In the county, the population was spread out with 22.8% under the age of 18, 5.1% from 18 to 24, 22.7% from 25 to 44, 32.1% from 45 to 64, and 17.2% who were 65 years of age or older. The median age was 45 years. For every 100 females there were 104.2 males. For every 100 females age 18 and over, there were 102.6 males. The median income for a household in the county was $27,711, and the median income for a family was $34,343. Males had a median income of $31,131 versus $24,271 for females. The per capita income for the county was $16,868. About 14.1% of families and 18.7% of the population were below the poverty line, including 26.2% of those under age 18 and 7.2% of those age 65 or over. The population ranking of the following table is based on the 2010 census of Trinity County. Wikimedia Commons has media related to Trinity County, California. ^ California State Association of Counties. "Cities Within Each County", ""California State Association of Counties"", Retrieved on 4 June 2018. ^ "Shasta-Trinity National Forest - Home". Fs.usda.gov. 2018-08-22. Retrieved 2018-08-29. ^ "Six Rivers National Forest - Home". Fs.usda.gov. 2018-08-24. Retrieved 2018-08-29. ^ "Mendocino National Forest - Home". Fs.usda.gov. Retrieved 2018-08-29. ^ "Shasta-Trinity National Forest - About the Forest". Fs.usda.gov. Retrieved 2018-08-29. ^ "Shasta-Trinity National Forest - Trinity Alps Wilderness". Fs.usda.gov. Retrieved 2018-08-29. ^ "Mendocino National Forest - Yolla Bolly-Middle Eel Wilderness". Fs.usda.gov. Retrieved 2018-08-29. ^ "CA Prop 64 state and county votes". Los Angeles Times. Los Angeles Times. Retrieved 27 April 2017. ^ "Ballotpedia California Prop 64 (2016)". Ballotpedia. Ballotpedia.com. Retrieved 27 April 2017. ^ a b c d e f g h i j k l m n o p U.S. Census Bureau. American Community Survey, 2011 American Community Survey 5-Year Estimates, Table B02001. American FactFinder. Retrieved 2013-10-26. ^ a b c d e f g h i j k California Secretary of State. February 10, 2013 - Report of Registration Archived November 3, 2013, at the Wayback Machine.. Retrieved 2013-10-31. ^ a b c Caltrans, State of California,. "QuickMap". quickmap.dot.ca.gov. ^ a b c d e f g h i j Office of the Attorney General, Department of Justice, State of California. Table 11: Crimes – 2009 Archived December 2, 2013, at the Wayback Machine.. Retrieved 2013-11-14.